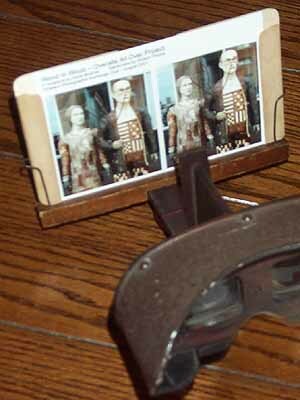 If you want to use digital stereoviews with a traditional Holmes stereoscope, you can do it one of two ways; with an adapter and with traditional Holmes stereoview cards. I have taken two approaches to adapters; an album and a single view adapter. The album has a front and back cover and protective sleeve pages bound with a spiral binding. The covers are 7" wide so they fit in a standard stereoscope and are high enough to cover the protective sleeves (4 1/2 inches). See Album below. A single view adapter can be bought or built that will fit in the stereoscope and hold the digital stereoviews without modification. Below are Single View Adapter Plans to show you how to make such an adapter. 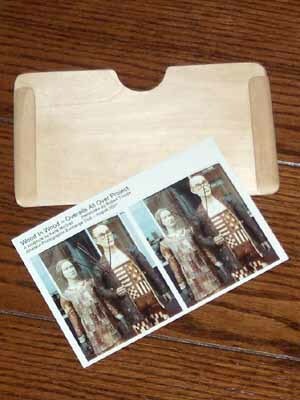 Another way to use prints made by the digital stereoview standard is to trim off the top 1/2 inch of the stereo print and mount the photo on a standard 3 1/2 by 7 inch stereoview card or untrimmed on a cabinet card 4 or more inches tall. 1 1 3/32" thick wood, modelers' plywood recommended 4" x 6 31/32"
2 2 1/32" thick wood, modelers' basswood or spruce 15/32" x 3 1/2"
3 2 1/16" thick wood, modelers' basswood or spruce 5/8" x 3 1/2"